Hong Kong weekly ratings are finally out, and it looks like we may have a new TVB gem in our hands. Yesterday, TVB officially released the ratings reports for the week of October 15th to 21st. According to the report, TVB’s new drama Life on the Line <跳躍生命線>, starring Joe Ma (馬德鐘) and Matthew Ho (何廣沛), has maintained its place as number one on the list, pushing nearly 30 points on viewership ratings. 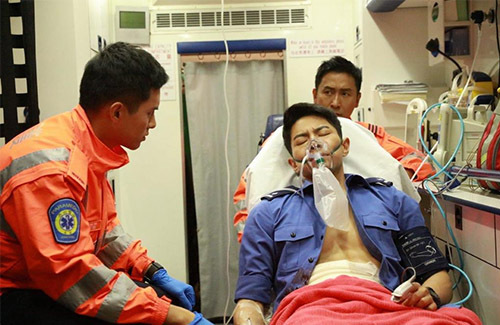 Last week, the television drama about Hong Kong paramedics debuted at number one in viewership ratings at a decent 26.9 points. This week, Life on the Line rose to an average of 29.8 points, with an average of 1.9 million live viewers in Hong Kong per episode. The drama’s rise in popularity is reflective of the positive feedback that it is getting among critics and netizens. Viewers praised the drama for being a good reflection of the role of paramedics and does not include much unnecessary fluff (at least, so far). It is very likely that Life on the Line will overtake Deep in the Realm of Conscience <宮心計2深宮計>, which is currently the highest-rated Hong Kong television drama of the year. In related news, Roger Kwok (郭晉安) and Frankie Lam’s (林文龍) Another Era <再創世紀> has also seen an increase in ratings last weeks, averaging 23 points. Another Era has already aired its last episode this past Sunday. I’m actually really liking this drama a lot so far. The theme of paramedics is new and fresh. Hope this drama continues to do well. Am enjoying it thus far but very cliche and Joe Ma needs to lay off the botox and skin whatever surgery he did because he looks like he had so much trouble just trying to cry hard. He was never very emotive as an actor but that scene where he cried very hard was terrible. He looked like he took 10 boxes of muscle relaxant so he couldn’t move any muscle on his face. And still terrible posture. So many new actors, not as many as OMG Your Honour, I have trouble keeping up with whos who. I hope someone at Jaynestar might consider writing an article introducing these new actors. especially OMG Your honour. Decent actors. TVB has new hope. I am getting very annoyed with the series’ PC stuff. That scene where Moon said “You are a murderer” was seriously such a funny scene. I wonder can any woman stand another woman giving birth to her husband’s child and having her husband run to the child each time? And not even 1 complaint is tolerated is too much for me.